Northern New Jersey winters can be extremely unpredictable, from a combination of snow, sleet and freezing rain to a blizzard that brings 30 inches of snow. So, when it snows in Union County, NJ, and the surrounding areas, you know that it could mean a slow in operations or no business for the day. At Castle Point Landscape Design, we don’t want to let a little snow get in the way of your profits. That’s why we offer complete, 24-hour snow removal services for commercial properties when the weather turns ugly. Each type of storm commands a custom-tailored approach to be safely and effectively handled. Castle Point Landscape Design has the experience and equipment to provide your NJ business with just that. As business owners ourselves, we understand the importance of efficiency and getting the job done right. To that end, we deal with snow in the fastest way we can, while ensuring that we account for even the smallest details. Safety is always a top priority and we take extra care in every job we run. From roadways to entryways, you can count on Castle Point Landscape Design to ensure that your business’s grounds are safe and well cared for. 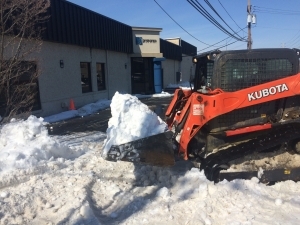 Our team understands the importance of delivering a safe, efficient and reliable service to your business and so we provide the highest levels of customer service, expert knowledge and personnel to perform the best snow and ice removal services available.